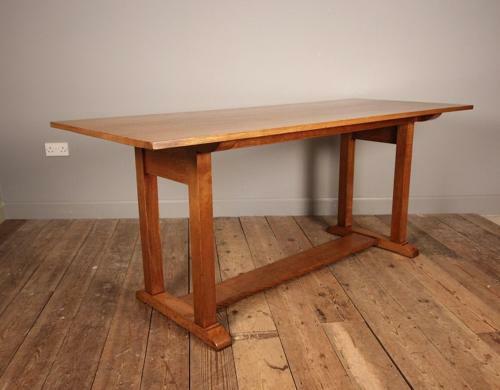 A neatly proportioned Heals of London Oak Refectory Dining Table, made in solid honey coloured Oak, having a rectangular top, raised on 4 legs and adjoined by a stretcher rail, very firm standing and in super condition throughout. With a generous leg clearance and oversailing top enabling you to seat either end of the table. Retaining the original Ivorine disc for Heals. English, Circa 1920.